At Goldcorp, we are committed to managing our impact on the environment. After a mine’s closure, our aim is to leave a sustainable legacy for present and future generations that we can be proud of. Goldcorp’s Marlin mine, Guatemala’s first large scale gold mine, closed in 2017 and has transitioned into a reclaimed and reforested area of biodiversity interest and research. In the early stages of its development, one of the main environmental commitments listed in the Marlin Mine Environmental Impact Assessment (EIA) – the process of examining the anticipated environmental effects of a proposed project, was to recover 190 hectares (ha) of forest during its operation. This was in compensation for the 60 ha that were planned to be affected by the construction and operation of the mine. To comply with this commitment, the environment team looked for a location inside the mine property that could make a big impact once recovered. The location selected was also a hydric recharge zone, which meant that recovery of this area also ensured water would be protected, thus enabling the reproduction of flora and fauna. By 2016, from the 190 ha committed, 632 ha of pine forest had been recovered. This was more than three times the EIA requirement, and 10 times more than the original forested area before the mine started construction. The Forest Recovery program was based on a variety of actions. For reforestation, seven native tree species were selected to be seeded. One million trees were planted and donated to the local communities. In addition, the EIA determined the existence of protected species in the forests around the Marlin mine. One of them was the epiphytes, more commonly known as ‘air plants’ which grow on the surface of a plant and derive moisture and nutrients from the air, rain and water. Specimens of this plant were rescued and reproduced in Marlin nurseries before placing them back into the forest. A biodiversity inventory began in 2010 with the objective of identifying the population and type of fauna present in the forest, including insects, reptiles, mammals, birds and fish. A module for fauna sightings was implemented in Enablon (internal reporting software), which can generate statistics and store photographic evidence. In 2004, a community reforestation program was started with the Instituto Nacional de Bosques (INAB) in Guatemala to encourage communities to seed trees. In this program, families were given trees to seed in their land and were given a monthly payment by Goldcorp after INAB certified they were taking care of the plants. 133 families signed on to the program, and more than $114K was paid to them. Training was provided to the communities to help residents understand the importance of preserving the forest, as well as the animals and plants the forest shelters. Community members learned how to register sightings, rescue injured animals and the correct procedures for dealing with endangered species. With these new protected areas, animals have returned to live and reproduce in great numbers. This phenomenon was documented in three books. One titled “Guía de Flora y Fauna Silvestre de Mina Marlin y sus alrededores” (Flora and Fauna Guide for Marlin Mine and its Surroundings), contains photos and brief descriptions of many of the species found in the recovered forest. The book was presented in 2016 to universities and institutions as a scientific tool that shows the importance of preserving the forest and as a demonstration of Goldcorp’s commitment to the environment and education. Marlin has become a hotspot for birding, with more than 185 species recorded at the site in 2018, a drastic increase from the 80 species seen in 2010. Since 2016, Marlin has implemented the “Bird Watching Program,” using the ebird.org platform from Cornell University’s Lab of Ornithology. This platform keeps statistics and compares migration and reproduction trends of birds. As a result, two publications have been created: Aves Silvestres Mina Marlin, Guia Ilustrada” (Birds of Marlin, Illustrated Guide), and Aves Silvestres Mina Marlin, Catálogo Fotográfico” (Birds of Marlin, Photographic Catalogue). Both books contain technical information about bird species found at Marlin, along with photographs taken at site. In 2016, the Council of Protected Areas (CONAP) extended a Biological Research License to the Marlin mine – the first time this type of license had been given to a private industry organization. Through this license CONAP recognized Marlin for its efforts to preserve biodiversity in the area and fight the effects of climate change. Erosion reduction, species preservation, water protection and clean air are some of the benefits of this program. 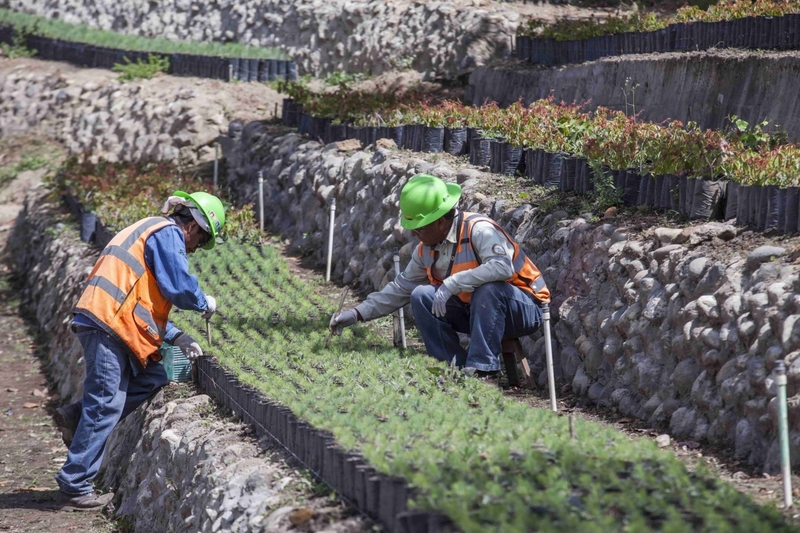 Through our commitment to responsible mine closure, environmental stewardship, research and education, the forest recovery around Marlin is one of the major legacies that Goldcorp will leave in Guatemala. To read more about Goldcorp’s commitments to the environment before, during and after mining, visit our 2017 Sustainability Report. Tailings Management – Time for Radical Innovation?